I decided to give the open match a go at Cunneries fishery today as i wanted another go at those pesky f1s which had done my head in on my last visit there two weeks ago and i had a few things that i wanted to try , we had suffered some really cold weather in the days leading up to today and every lake i passed on my way there was froze solid with an inch or more of ice covering the surface but at the Cunneries they like leaving the aerator on so that it never freezes but by doing that it mixes up the waters natural thermocline and as a result makes the fishing even harder . O arriving at the complex i parked near the old canal because that was where the open was scheduled to take place but after walking over to the cabin to book on i was informed that because of the big turn out the match would also be on the first leg of the S canal too , i didn’t really think that by doing this was going to make it a fair match as the old canal holds bigger f1s plus more carp and one of the 12 man sections would be split over the two canals but there wasn’t a great deal i could do about it now . The draw was done the same as on Sycamore fisheries where they call your name out in order of when you had booked on the match , when it was my turn to pick it looked like my drawing arm had returned as out came peg 21 which meant i was on peg one of the S canal a nice end peg but on the down side though was i had the aerator in my swim which had blown out all the ice water since Weds when they had broken it up . I decided to put all my swims well away from the aerator but with it being peg two miss one i didn’t have a great deal of room to work with . When the all in sounded i proceeded to dob bread at 2ft which was a foot off the deck , my rig was a light 4×8 scone float with 012 garbo main line and a 010 garbo hook length which had a size 18 gamma pellet hook . I left a longish 2ft lash between pole and float so i could easily alter the depth but more importantly keep my top kit well away from the float in the clearish water i had a couple of back shot on too which helped me control the rig and also connect with any bites , i worked my rig all along the far bank going into any little holes between the reeds changing depths to try to find the fish and i even tried maggots but i never had a sign in thirty minutes . Luckily i hadn’t fallen too far behind as no one within eye shot had caught either so i decided to change to my 4ft rig which was a 4×14 malman roob with 010 direct to a size twenty matrix bagger hook , i started directly in front off me with an expander on the hook and a few micros in the preston cad pot i decided to kick off with these because it’s what i had the most success with on my last visit but even after setting up multiple swims along the far bank and even changed to maggots but i had only one lost or bumped fish to show for it in an hour not the start that i was looking for . So i changed to my third rig which was a malman roob on 010 direct to a size twenty matrix bagger hook but this time it was set at 3ft so i could go further up the slope closer to the far bank reeds , i purposely left using this rig for later in the session because i wanted the sun to warm up the water a bit and it was also the depth that i had originally expected to do the business going from previous sessions i had on here my reasoning behind this was i wanted to leave a safe area for the fish to settle in and feed more confidently . So i was somewhat surprised that yet again after setting up a few different lines i only had another lost or bumped fish to show for it but it looked like it was fishing extremely hard as the guy on the next peg had suffered with bumped fish too but at least he had one fish in the net , my mate also came over saying he was still fishless but rather than getting down heartened this just spurred me on to try to find those elusive f1s . The only place that i had left to go at was somewhere that i least expected the fish to be which was the reed lined banking in between the aerator and bridge , i plumbed up to find 3ft depth at nearly 11 meters to my left hand side and i tapped in six pinkies with a red maggot on the hook a few lift-drops resulted in the slightest blink and you missed it indication , a sharp lift produced my first f1 of the day and after nearly three hours it was more than welcome i hoped a few more would follow . On my next ship out i was unsure whether to re-feed or not so i decided to put a few pinkies in the cad pot but not tap them in just yet and see what happens first , it looked like i had made the right decision on holding back because i had a quick bite and soon f1 number two graced the net . After managing a further six f1s in an hour they understandably backed off from the feed or had moved up in the water because i began getting all sorts of funny indications on the float and i even had a run of foul hooked fish so i decided to put on another section going closer to the bridge , i started the feeding process again but made a determined effort not to over do the feeding and i even cut out the pinkies in case that had been the reason for them coming up off the deck . 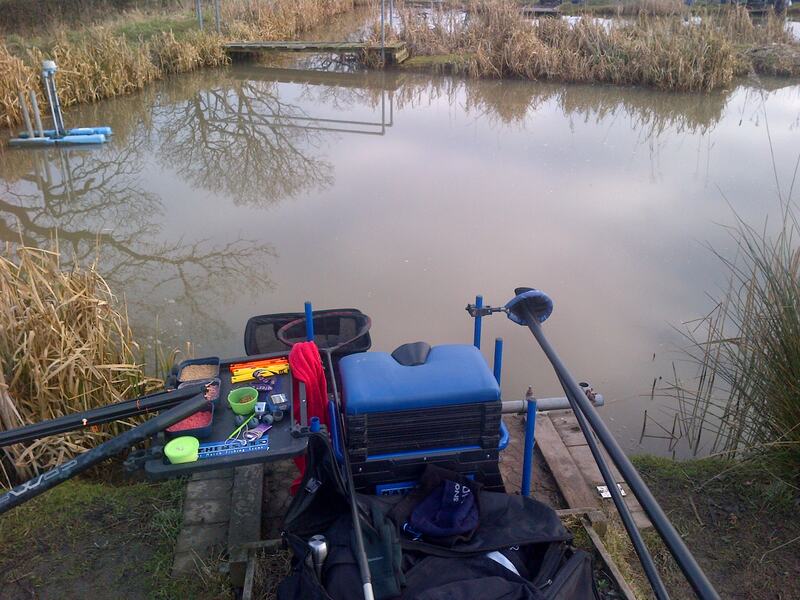 By changing between the two swims i managed another six f1s which put me on a total of 12 and i just wished that i had found them sooner but thats all part and parcel of winter f1 fishing location location location is the key . 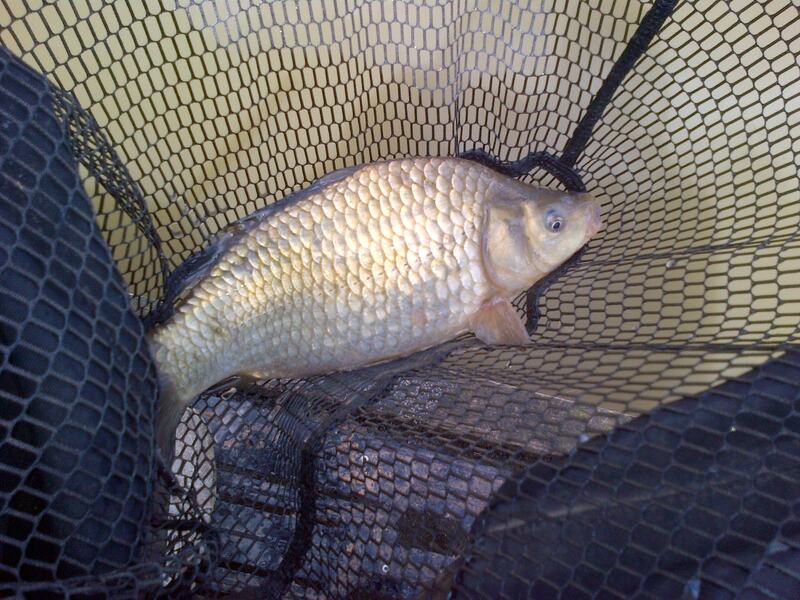 When they began the weigh in my net went 13lb 8oz which was more than double that of the next best weighed on the S canal but like i mentioned earlier it was a split section of 12 anglers and the remaining two was on the old canal , luckily i had beaten those two so at least the section was mine but could i do any better and manage to frame .The old canal fished a lot better in parts with 43lb winning from peg 17 and 18lb coming second from peg 18 both of these nets consisted of mainly carp so you didn’t need to catch a great deal for a nice weight , there was also a 14lb from peg two so i ended up 4th overall which wasn’t to bad i suppose because after giving them all a three-hour start i couldn’t really expect a better finishing position . 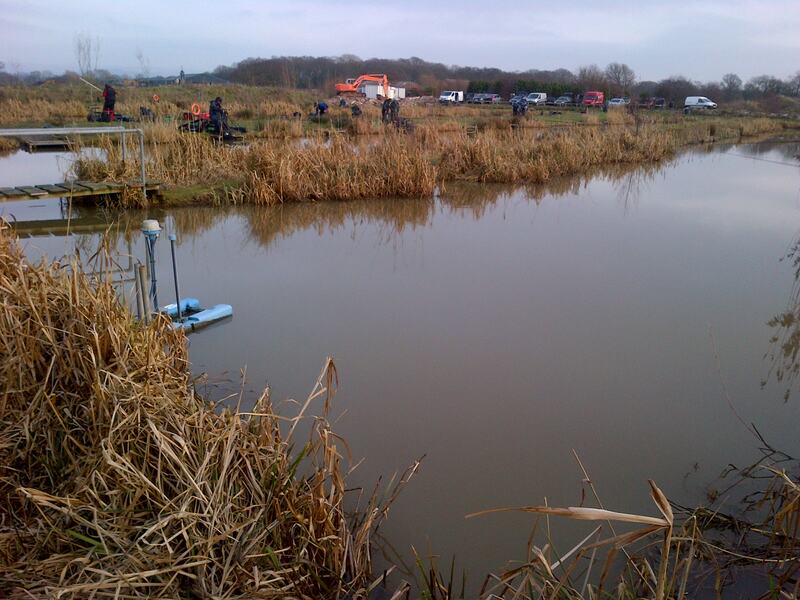 Next week it will be taking place on all four legs of the S canal which will make for a fairer match , i wont be able to make that one but will be back in a fortnight as it made a nice change fishing against different anglers on a new venue . I am off for a bit of silver bashing at Heskin tomorrow so icebreakers at the ready and next Sunday im standing in for my mate on the Leigh tackle and bait winter league where i will be on covey five lets hope it fishes as well as it did on my last visit their where i managed second on the lake with 45lb . 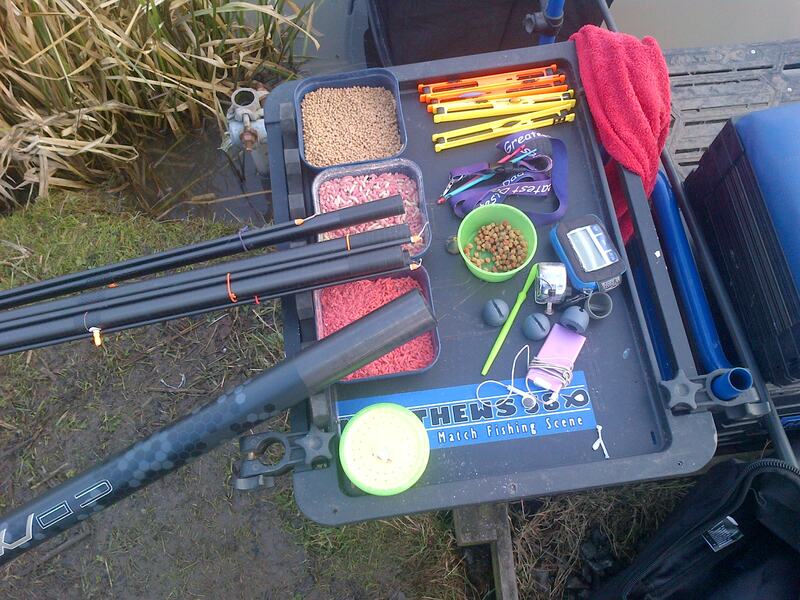 This entry was posted in CUNNERIES and tagged Common carp, covey, covey five, f1 fishing, Fishing bait, gamma pellet hook, garbo line, Heskin hall, Maggot, malman roob, matthews580, Mirror carp, Partridge lakes, Recreation, Scone float, silver fish fishing. Bookmark the permalink.